An Alligator Corndog from Somethin’ Else Café, a Beef Debris Po-boy With Truffle Coleslaw from Restaurant R’Evolution, Grilled Chicken Livers with Pepper Jelly from Praline Connection, and an Abita Strawberry to wash it all down — sound familiar? That’s just a typical run of a foodie darting from restaurant to restaurant searching for the best local grub available at the beloved French Quarter Fest. While music may be at the heart of this free New Orleans festival, food plays just as important a role in the fest experience. After all, while attendees are watching the hotly-awaited return of Dr. John, they’ve got to have something great to eat and good to drink in hand as well, right? That is the firm stance taken by French Quarter Fest organizers, and their devotion to food shines in the vendor lineup and food setups arranged across the festival grounds. Jackson Square, the Riverfront, and The Mint have been the quintessential food vendor homes for years, and last year, a new food area opened up at 500 Decatur St near the Cajun-Zydeco Showcase—so there’s plenty of nom noms to find no matter where you are in the French Quarter or along the Mississippi River. In addition to simply providing the best local food experience possible, French Quarter Fest aims to help out the restaurants on their end as well. 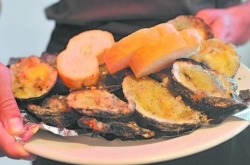 A dedication to promoting New Orleans restaurants has been a tenet of French Quarter Fest’s mission from the beginning. Founded in 1984, French Quarter Fest was intended to be an effort to drive more people and business to the French Quarter during a time of street and sidewalk renovations and steep competition from the World’s Fair, hosted in New Orleans that year. French Quarter Fest was a way to draw people into the neighborhood, its restaurants, its music venues, and its shops, and the event has taken off beyond what anyone could have imagined since those early festivals. As one way to promote local restaurants, French Quarter Fest takes a different approach to advertising the establishments and their food. 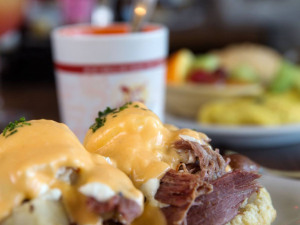 Instead of strolling through Jackson Square and seeing huge signs for Brisket of Beef With Horeseradish Sauce, Crawfish and Goat Cheese Crepes, and Demi Baked Alaska With Chocolate Sauce, you’ll instead be greeted by prominent signs for Tujague’s, Muriel’s, and Antoine’s, respectively. Knowing what restaurant you’re looking for helps to create a sense of being a regular patron to an establishment you might not readily go to outside of the festival. This patron-restaurant relationship is so strong at the festival that many vendors request to be located in the same spot year after year. Several of the vendors have been with the festival since the beginning: Vaucresson Sausage Co., Ted’s Frostop/Mrs. Wheat’s Pies, Tujague’s, Desire Oyster Bar, Gumbo Shop, Trey Yuen, Ristorante Carmelo, Court of Two Sisters, New Orleans Daiquiri’s, and Pat O’Brien’s Bar. Many of their offerings have become festival classics and best-sellers each year. Whether you decide to munch on a Crawfish Pie from Ted’s Frostop/Mrs.Wheat Pies, Shrimp & Alligator Sausage Cheesecake from Jacques-Imo’s Café or a Pulled Pork Sandwich with Coleslaw from the Joint, you’re sure to tantalize your taste buds in the name of New Orleans’ premiere restaurants at this year’s French Quarter Fest.